We all have different ways to procrastinate, and most of the time it involves a device (computers, phones, tablets). Whether we surf the web, read articles, try new apps, watch videos, or chill out at the coffee machine, our goal when we procrastinate is just to do something else! The first step to turn our procrastination habits into productive ones, is to understand why we procrastinate. Is it because we are lazy? Because we feel unproductive? Because we 're not organized? Or is it just because what we have to do is really unpleasant? Sometimes you often find yourself procrastinate because you have this really tricky task to do and you don't know where to start or how to manage it. So, couldn't it be interesting to find a way to do some productive procrastination?! My personal procrastination refers to a loss of personal productivity, at some point in my day I don't know how to manage what I have to do, I don't feel creative and ideas won't come up. But procrastination doesn't mean doing nothing. My advices today won't be about curing procrastination but how to procrastinate well. 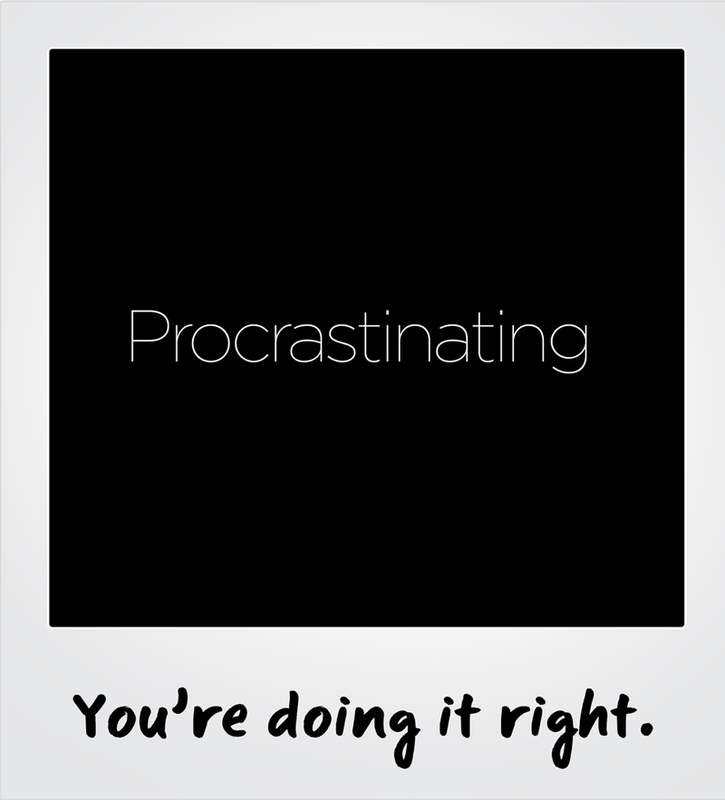 So here are 5 tips to productively procrastinate. You may procrastinate because what you have to do is unpleasant, or you're disorganized, or you feel overwhelmed by the task. Maybe what you need to motivate yourself is to find inspiration to accomplish your task. You need to go look for information that will help you get back on track. And the Internet is full of information and ideas to help you accomplish your task (of course you'll have to look in the right direction and not loose yourself...). Even if it's not fully relevant information, just the action of looking for it might help you find new ideas to accomplish your task. A friend once told me: "Creativity is the art of not revealing its source". So if you're feeling down and don't know how to accomplish something go find some inspiration! Need a break? Can't deal with what you need to do? Why not take few minutes to discuss it with a friend. It's often when you're talking about something that you're solving problems, just by putting words on what you have to do. Talking to a friend who is not working with you can have multiple effects. It can be totally useless… or it can help you find awesome solutions. I have few close friends who are working in startups like me. And when I feel like procrastinating I chat with some of them about the things I have to do that are bothering me. I ask them for their opinion and advices. I've found this activity very productive. In fact, discussing about your work problem with people outside of your work can sometimes leads to great new ideas! Well, this might not be the most productive activity but the goal is to get some fresh air. If you can't work on a task and keep postponing it, try to take a walk outside instead of staring at the internet. If you don't abuse, procrastinating outside the internet will really do some good to your brain and to your productivity. Just stop staring at screens. This is the most productive tip to fight my useless procrastination. When I can't work on something I write down stuff. It might be a list of things I want to do, an article, or just writing what I've done so far and what I need to do to complete this task I can't work on. The good thing about writing is that you keep track of it, you can share it, and someday you'll find that piece of essay useful for your work. My mathematics teacher once told me: "I don't need to keep a close eye on you to make sure you're working. I'll figure it out by the amount of rough copy in the trash". "Writing is learning, the more you write, the more you learn." Paul Graham: "The most impressive people I know are all terrible procrastinators. So could it be that procrastination isn't always bad?"